Pete has been involved in choral direction ever since his days as Organ Scholar at Corpus Christi College Oxford in the 80s. He has run church choirs in Bristol, Harrogate and Birmingham and since October 2011 has been Musical Director of Choir With No Name (Birmingham). 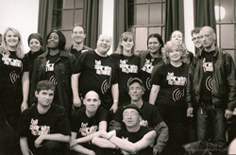 CWNN is a choir for people whose lives have been affected by homelessness. For more info and details of any upcoming gigs follow Birmingham links at CWNN Pete is also involved with singing in prisons, and with Choirs Beating Time is currently running three choirs based in different Midlands' prisons.